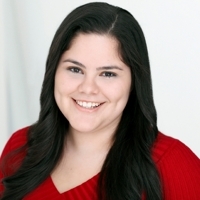 Daisy Guevara is a singer and actress who has performed on stage throughout the tri-state area! When she’s not performing on stage, she’s voice acting in anime, video games, animation, and audiobooks! You can hear her work in anime as Rona Elmo in Juden-chan, Mimina Osawa in Ladies versus Butlers with Media Blasters and she is also cast as Kenta in Awesome Japan’s upcoming anime, CHUYADEN. In the gaming realm, Daisy voiced in Marvel Avengers Academy as Spider-Girl, Heroes of Newerth, Secret City: London Calling, Zilant: Dragon Age and many more! Daisy has also voiced in the popular YouTube series: MyStreet’s Phonix Drop High: Graduation Days and Falcon Claw University as the role of Diana. In her spare time, Daisy loves belting Disney or Broadway tunes; sing her something and she might just sing along with you!